Game fishing is the term used to describe fishing in freshwater for salmon, sea trout, brown trout, rainbow trout and grayling. Many years ago private estates controlled good game fishing. Today there is excellent game fishing for everybody in many rivers and numerous reservoirs and lakes. There are three distinct methods for catching game fish: bait fishing, spinning and fly fishing. Choose a lightweight rod which could also be used for coarse fishing and a fixed-spool reel. The fixed-spool reel is very easy to operate because it has a simple arm system that collects line when the handle is turned. Fixed-spool reels also allow line to run free which is particularly useful when fishing in fast flowing rivers and streams. Put a line of about 4lbs breaking strain on the reel. If a trout of more than 4lbs is hooked the line will not necessarily snap. The fish is not a dead weight because it is supported by water and therefore lighter. A selection of different floats is needed to match different venues. Small floats for streams and larger ones for rivers and lakes. Split shot is required to balance the float. Choose barbless hooks because they cause less damage to the fish and are quicker to use when unhooking your catch. Small hooks of size 14 or 16 are adequate when using maggot for bait. If the water is muddy try worm on a larger hook. Spinning is the method of fishing with artificial bait. Spinners are made from bright coloured metal and can be cast great distances. When they are retrieved the spinner rotates and vibrates. This movement is intended to imitate a vulnerable or injured fish and will prove tempting to a hungry predator. Rods for spinning tend to be smaller than bait rods. Choose a rod with a handle that has screw grips for holding the reel in place. Use a line of about 6lbs breaking strain on a fixed-spool reel. For catching salmon try a lure called a Devon Minnow and a small Mepps spinner can prove effective for tempting trout. Many anglers regard fly fishing as the classic method of catching salmon and trout. There are two types of fly fishing: wet fly and dry fly. Wet fly anglers use hooks that are wrapped with bright threads and portions of feathers. They are designed to resemble insects and creatures found on the surface of the water. They are called wet fly because they slowly sink. Dry flies are designed in the same way as wet flies but are treated with a water repellent material to prevent them from sinking. 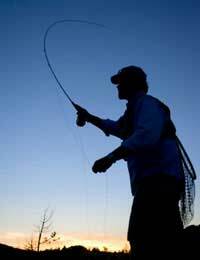 Special rods, reels and floating line are needed for fly fishing. Rods for trout and grayling tend to be single handed but for salmon fishing the rods are more powerful and often double handed. A landing net is an essential part of every game angler's tackle. The net is usually collapsible and the handles are telescopic which makes reaching out easier to land a stubborn fish. Waders are important in large rivers, lakes and reservoirs. When the riverbed is slippery or uneven a wading stick could prove a life saver.